Can the Eurozone be More Democratic? How the eurozone will be governed in the future is a matter of much debate and is expected to form a key part of the European Council meeting in June. Here, Kevin Featherstone argues that the debate is neglecting a key set of questions: how can its governance be made more democratic and accountable? The answers to these questions will likely impact on the expansion or shrinking of the countries participating in the euro in the longer-term. The current debate on reforming the eurozone is fixated on questions of completing the banking union, the creation of an expanded stabilisation fund, and new forms of fiscal governance. What is missing here is serious discussion of how, at a minimum, the application of EU-level fiscal rules and programmes at the domestic level can meet acceptable criteria of democracy and legitimacy. More ambitiously, ideas of eurozone institution-building risk alienating voters further if they, too, lack new forms of accountability. The debate over the reform of the eurozone has rumbled on, responding to the unprecedented ‘bailouts’ among member countries. The ‘Four Presidents’ Report’, then the ‘Five Presidents’ Report’, a Commission White Paper, and a Reflection Paper each recognised that “greater responsibility and integration at EU and euro area level should go hand in hand with greater democratic accountability, legitimacy and institutional strengthening”, as the Five Presidents put it. But the debate was suddenly heightened by the ambitious pronouncements of the new French President, Emmanuel Macron, last year—particularly, his ‘Initiative for Europe’ launched at the Sorbonne in September. Keen not to be overtaken, the EU Commission President, Jean-Claude Juncker, made further, parallel proposals in December. The key bargaining is, inevitably, between Paris and Berlin, where Chancellor Angela Merkel faces difficulty in getting her Christian Democratic Union (CDU) party on board, even if she wished to. It’s not clear how she will make good on her initial warm words to Macron when the matter is discussed by the European Council at its meeting on 28–29 June. The intention was to agree a roadmap for eurozone reform at the summit, but few now expect any bold moves to be made soon. This slow pace of progress is risky. There is a logic and coherence behind the French ideas on institutional reform. Indeed, they hark back, in part, to the notions of economic governance floated by Pierre Bérégovoy in the late 1980s, when he was the French finance minister. Last year, Macron called for the creation of a new permanent post of a European finance minister, a separate European Parliament for the eurozone, and a ‘real’ eurozone budget, crystallising the ideas that had been floating around EU circles in recent years. At the Sorbonne he said, “we need convergence and stability through national reforms, but also by coordinating our economic policies and a common budget”, and argued that the “budget must be placed under the strong political guidance of a common minister and be subject to strict parliamentary control at [the] European level”. Macron signalled that the European minister should be linked to a new executive function dealing with macroeconomic policy. With this in mind, Juncker then reformulated the idea to suggest the minister might also be a vice president of the EU Commission. This risks subverting Macron’s bold innovation, however, under a structure designed for the more limited European Economic Community in the 1950s which, by elevating a technocratic elitism, is seen as being out of synch with the current public mood. German views on euro-governance are more complex than Juncker’s and Macron’s, if not confused. When negotiating the Maastricht Treaty, some like Hans Tietmeyer (later to be president of the Bundesbank) saw the necessity of building a political union in Europe before embarking on a single currency. This was dubbed the ‘coronation theory’ of the Economic and Monetary Union. Others, while supporting the hotchpotch political union placed in the Maastricht Treaty, wanted to block a fiscal union for fear of the liabilities to Germany. In recent years, both Merkel and her former finance minister, Wolfgang Schauble, have talked of a need to strengthen economic governance in the eurozone. But they have emasculated Bérégovoy’s original ideas by placing them firmly within the traditional German rules-based frame of ‘ordo-liberalism’. A central tenet of the latter is to place responsibility for fiscal policy—through binding rules and at the risk of penalties—on national governments. This leaves little scope for EU-level competences. Thus, the CDU recently issued a statement rejecting Macron’s ideas as they involve “even more common liabilities, bureaucracy and centralism”. Yet, most accept that the provisions for eurozone governance remain incomplete. Merkel may agree to the creation of some kind of ‘European Monetary Fund’ to help stabilisation within the eurozone, but not a new eurozone budget or polity. This does little for economic convergence or democratic processes. 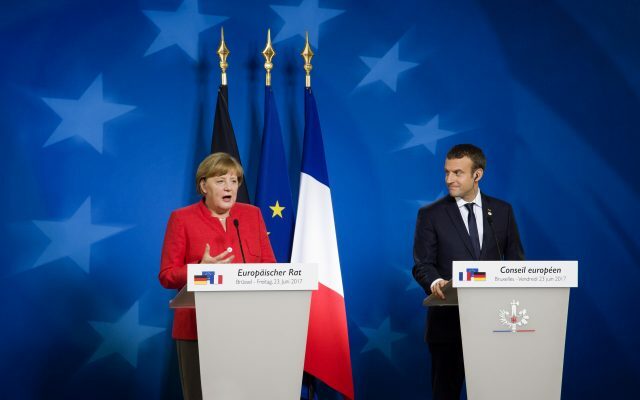 In a wide-ranging report last January, fourteen French and German economists attempted to outline a compromise plan for eurozone reform, reconciling the risk-sharing instincts of Paris with the risk-control sensitivities of Berlin. While they recognised the relevance of ‘adequate accountability’ and of the debate over a possible future political union, they choose to put these matters largely aside. This is a mistake as it skews the debate. Somewhat tellingly, on the particular issue of possible bail-out type interventions in the future, they saw this responsibility being given to an expanded European Stability Mechanism. The ESM would design and negotiate the conditional assistance programmes. Its board of directors would be appointed similar to that of the IMF’s governing body. And, the ESM’s managing director would be obliged to answer questions from the European Parliament. Financial control—whether to provide the money—would remain with the member states. Such ideas fail the test of democratic legitimation. They are akin to the ECB model: experts will set the policy, governments will determine the cash. Thus, they may be little advance on the ‘Troika’ mechanism, representing the EU and the IMF, which was traduced not only in Athens but also in Dublin, Lisbon, and Cyprus. The problem of legitimation already exists and needs addressing. Moreover, EU member states inside and outside the single currency differ greatly in their domestic institutional capacities to deliver structural reforms. Whether following the Macron model of creating new EU institutions or settling for Merkel’s insistence on a rules-based strategy, there is a need to connect eurozone governance with its base by helping member states strengthen their own institutions. In its paper last December, the Commission picked up sensitive questions: How can the EU intervene to support member states who want to converge, but are unable to? If Berlin rejects the Macron model, how does it envisage the elaboration of bailout conditionality or a European economic agenda being made more democratic? Macron’s ideas form a powerful référentiel for a necessary, and overdue, debate. The onus is on Berlin to explain its solution to the problem of incomplete euro-governance. Its current minimalistic approach invites long-term of shrinking the eurozone or making it even more exclusionary. The euro-crisis has shown the difficulties facing some states to remaining in the club while the EU’s heterogeneity challenges its expansion. Already, the status quo leaves Germany exposed to populist attacks, not as the ‘reluctant hegemon’, but as the insensitive despot. It is the hegemon in terms of the policy paradigm, forcing ordo-liberal precepts on the rest of Europe and often usurping the role of EU institutions. Germany’s post-war chancellors before Merkel have feared such reputational damage and have sought to hide its raw power within a European architecture. So in the absence of fully worked out alternatives, the question is: Angela, can you afford to ignore Emmanuel? Professor Kevin Featherstone is Head of the European Institute at the LSE.